It’s no secret that the government shutdown of 2018/2019 is far too long, having far to large of an impact, and is just overall ridiculous. We watch every day to get the latest information only to find out that nothing has changed. And, I’ll be honest, as terrible as it is what our country is doing to its employees, we didn’t really think it had much of an impact to us. We don’t work for the government, we don’t rely on food stamps, and are just overall incredibly fortunate for our situation amid all of this chaos. **Update:** As I was posting this article to the blog, I heard news of a 3 week stop-gap bill that will allow government agencies to open temporarily until a final budget is put in place. This is fantastic news and will greatly impact the lives of many in a positive way. However, please keep in mind that while things are on their way to being put back in order, the National Parks are still in disarray and this shutdown will potentially have impacted ecosystems for many many years to come. Did you know traditional mattresses are actually toxic? This is not something I knew until I started looking at what mattress options we had for in the van. And no, I have not been sleeping on the floor until now, I just never purchased a mattress before. If you are like me, when you went from living at home to moving out, your parents let you take the mattress you had already been sleeping on with you. Which is awesome and amazing that as a newly adulting human, you don’t have to add buying a mattress to your ever-growing to do list or never-ending to buy list. But, that mattress that you’ve had (for probably far too long, it’s suggested to get a new one every 7 years, by the way) is potentially toxic unless your parents were into that sort of thing and set you up right from the get-go. You guys, it’s been so long since I’ve done a non-van related DIY! And I miss it! I have been wanting to do this DIY for a while now but just haven’t gotten around to it until now. Lately, Ben and I have been eating less healthy (fewer veggies, more meals out, etc) and I feel like it has started to affect us; we snack more often, feel less motivated to go to the gym, and could just really use a boost. So I think this DIY is the perfect accessory to encourage us to go to the market and get fresh veggies more often. Plus, it’s summertime which is the best time for fresh veggies so why not enjoy them! Let's Celebrate National Hydration Day! It’s officially summertime! And along with the sunshine, outdoor activities, and warmth comes dehydration. Dehydration can have all sorts of nasty side effects on your body, that’s why it’s so important to drink water regularly! So as a reminder to drink more water every day, especially in summer, we are celebrating National Hydration Day today! Are you hydrated? Maybe not enough? Let’s start this post with a little challenge: grab a glass of water (preferably in a reusable vessel) and try to drink the entire glass before you finish reading this post. Yep, I’m now that difficult person. When the incredibly nice Starbucks employee asks: “Hi, what can I get you?”, I respond, “Hi, I’d like a cold brew with sweet cream, no ice, no straw, please.” and I used to make fun of Ben’s “Medium iced tea, light ice, two pumps simple syrup” order. Welcome to Filmore the Van! We are Rebecca, Ben, Arrow, and Filmore! 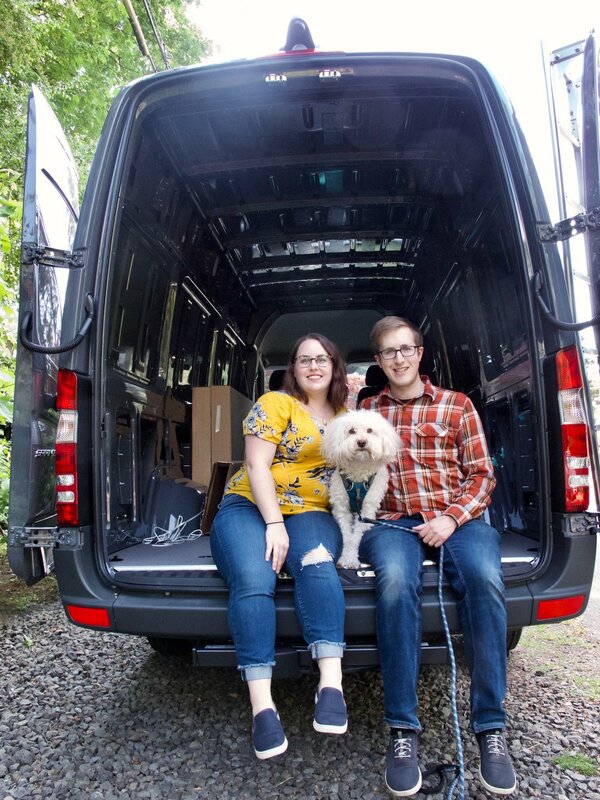 This is our space to share our thoughts on a variety of topics centered around living a healthy and creative life as we build and explore in a converted sprinter van (Filmore)! Sign up with your email address to receive the monthly newsletter!